We caught the 9.03 train and arrived in Kyoto at 11.9. 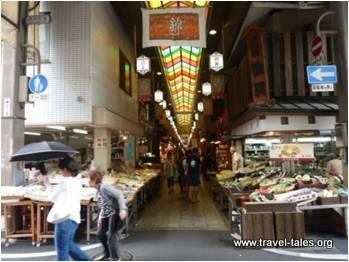 After dropping our bags at our hotel, we took the underground train two stops to go to the Nishi market. This proved to be one very long thin one, just the one aisle with shops on each side. Mostly food but not only. We found ourselves some lunch to eat on the go as we walked through. At the far end we found we were in a pedestrian shopping area and followed this through to another underground station and again went 2 stops and got out just beside the Nijo castle. We hired an audio guide which was rather different to any we had ever had before. It was like a fat pen and had to be pointed at the appropriate places on a piece of paper to tell us about the castle, palace and gardens. It meant that we only needed one because there were no earphones and we could both listen at the same time. This post is an extract of my mother’s travel journal written during a tour of Japan in 2014.